The Y Water Discovery Centre was our first stop in Yea, as it incorporates the Visitor Information Centre. 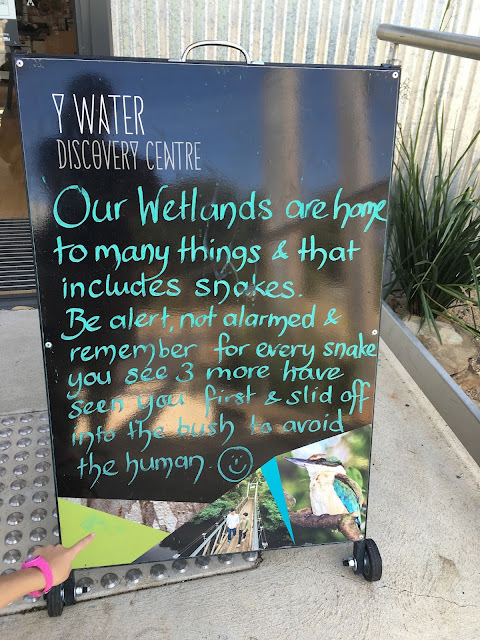 We stocked up on maps and brochures of things to do and see in the area, thanks to the lovely ladies who volunteer at the Centre; we checked out the informative displays about water resources and then headed out to the adjoining Wetlands for a walk in the bush setting. Crossing the 30m suspension bridge over the Yea River, we headed off along the circuit track. Wooden boardwalks and level tracks cover the 1.8km trail, making it very accessible and the location just off the main street is ideal. The Wetlands Walk is great for birdwatching and the ladies inside gave me a list of the birds (and all the other critters) that inhabit the area. Dedicated viewing steps and hides are around the tracks. We could see and hear many birds on our walk, but the furry locals were well hidden that morning. I'm terrible at remembering bird names - they go in one ear and out the other - but thanks to my list, I was able to identify this Red-Browed Finch. Yay me! Or should I say, "Yea" me. This guy I do know. The beautiful Superb Fairywren. He followed us around for ages, hopping alongside us, watching us watching him. After reading this sign at the entrance, we were amazed that we did actually see one snake's tail slithering off under a shrub...the other three must have seen us first. It was a good introduction to the flora and fauna of the wonderful High Country and a great place to start exploring the area.